← want a postcard? i want to send you one! Brazil is truly a magical place. we haven´t been relaxing on the beaches as i had planned but instead have been sucked into the energy and life that is pulsing on every corner we turn. a quick explanation of our time in Rio de Janeiro… sprinkling rain kept us from the beaches but we found dry moments to take in some live music at a famous but intimate, hole in the wall place called Bep Bep. we took a train up to see the christ that looks over the city. we had no interest in going out to the clubs in Copacabana but found that the Brazilian youth party in Lapa so we caught a bus and experienced some serious samba and bar hopping. not to mention the lively ride there… we were immediately taken in by the people around us. they taught us samba (whoa), others showed us where to drink and which street vendors to eat at. we were pulled into unfamiliar team games at a pool table. met many friendly faces. enjoyed watching the transvestites slinking around in gangs of hairspray and eyeshadow. even witnessed a fellow hostellor get scammed by a drug dealer and a cop. so we had some great times despite the dark cloud overhead. eventually we were so bummed at waking to rain everyday that we threw in the towel and booked a bus to Salvador. now Salvador is a funny place… all big cities in brazil are dangerous. but we were especially on our toes once in Salvador. we got in at 1 in the morning after our bus was delayed 6 hours (total 34 hr ride) so we didn´t have a hostel and the streets were deserted and sketchy. we got a cab and the hostel we ended up at was fantastic, Saõ Jorge. no americans. it was in the center of the historic city. in the morning light, the area transformed into such amazing colors and character. music everywhere. cobblestone streets (which, uncomfortably, they used to call “black mans heads”) it all seemed amazing to us. 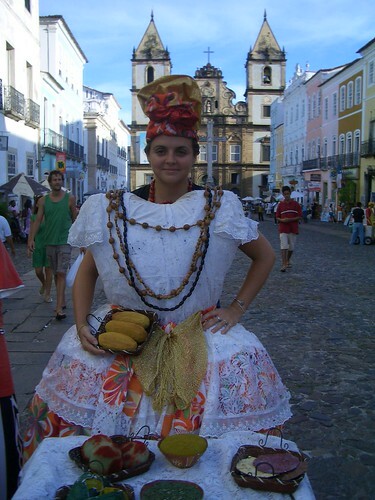 also i should mention that salvador was the center of the brazilian slave trade. so the culture here is very influenced by the african roots. andrea and i are like headlights in the nights. it wasn´t till a bit later in the day we thought we´d roam. our favorite thing to do. but were stopped by locals when we went to turn out of the tourist area. suddenly we realized how literally fenced in we were. the historic center had been emptied out… the people actually removed, so that the buildings could be cleaned up and they turned it into a tourist attraction. – that we were stuck in! more in a bit… we´re in Lençóis now (have been for a week) and are enjoying the quiet and familiarity of the people here. made lots of friends with the help of a guy we met in Salvador. today we´re going out to some (more) waterfalls. there are dozens in the area.